. يعمل Majestic Minima Hotel على ضمان إقامة مريحة لضيوفه من خلال خدماته الممتازة وحسن ضيافته. يقدم الفندق واي فاي مجاني في جميع الغرف, خدمة التنظيف يوميًا, مرافق مخصصة لذوي الاحتياجات الخاصة, تخزين الأمتعة, واي فاي في المناطق العامة لضمان الراحة القصوى لضيوفه. استمتع بوسائل الراحة الراقية في الغرف أثناء إقامتك هنا. بعض الغرف تتضمن تلفزيون بشاشة مسطحة, اتصال لاسلكي بشبكة الإنترنت (مجاني), غرف لغير المدخنين, مكيف هواء, تدفئة لمساعدتك على استعادة طاقتك بعد يوم طويل. صممت خدمات الاستجمام في الفندق والتي تتضمن مسار جولف - ضمن 3 كم لمساعدتك على الاسترخاء والراحة. مهما كانت دواعي سفرك فإن Majestic Minima Hotel هو خيار ممتاز لإقامتك في أديليد. يعمل مكتب الاستقبال من الساعة 07:30 AM إلى 10:00 PM. الحد الأقصى المسموح به لارتفاع السيارات في ساحة الانتظار هو 2.1 متر. Yes the rooms are small but the have everything you would need in a great location close to cafes and restaurants. Walking distance to the zoo and city along the river. Staff are very friendly and there is onsite parking downstairs in the basement. Yes the rooms are small but they have everything you will need in them. The location is fantastic, lots of cafes and restaurants around it and only a 15 minute walk to the zoo and 25 minute stroll into town along the well maintained walking tracks along the river. Staff were very friendly rooms are kept very clean. I liked the art in the room. The TV is placed at a nice angle to watch from the bed. The bathroom is colourful. The space utilisation is perfect. Wall painting big and nice each room there is different one.Bathroom isn’t big.Tv angle is nice to watch while lie down.Good place to stay really! Room was clean and decent, great location with restaurants and cafes around (some were open on the NYE and the following day), nice walking distance to the city bridge, river and zoo. Staff were friendly and helpful. MM is located in Melbourne street I’m Adelaide which is extremely central but also peaceful. Melbourne Street has plenty of great restaurants a coffee bars, and a careful search around the area will reveal some great pubs (the English) and the park is right next door for running. Cycling etc. it’s a 20 minute walk along the river into Rundle Mall, but the hotel has free bikes so you can speed everything up and explore through the main block of town and the cool area behind UniSA towards west terrace. Great place, rooms are good size for price and beds are comfy and large. Rooms put emphasis on things that matter, bed and large bath room. A friend and I made a last minute decision to head to Adelaide from Melbourne, and when we saw Majestic Minima while researching accommodation we loved the concept. We are big fans of art boutique/eclectic hotels and we enjoyed our stay here. The artist's murals in our room were awesome, much nicer to spend time in when not staring at bland walls. The beds, pillows and linen were very good quality and immaculate. The whole room (and bathroom) was spotless. The rooms are on the smaller size but we still felt comfy and cosy, not claustrophobic. We loved the mini balcony off our room, and the guest balcony option as well. Laundry facilities in the basement are really handy. Service was excellent, staff were helpful and friendly. It's location in North Adelaide is a little bit out of the city but that area has a mini bohemian/cosmopolitan vibe which we loved. We walked to the city in 20-25minutes, through some lovely parks & the river. Free bus from around the corner takes you to the city too. Overall, highly recommended, very good value for money, worth it for something a bit more quirky with a bit of personality! Room size is rather small but can't complain with a King-sized bed and all necessary amenities (iron, ironing board, hair dryer, safe etc.) provided, very clever room layout! Room is still quite new & very well maintained. Very happy with the cleanliness of the room! The only con: paid parking! Convenient, car park is available per day at AUD 10, I booked it for a friend who appreciates the small balcony which he can walk out to. Room is nice and a comfortable place to stay in. It has good eateries around. We love the location, the super comfy bed, the friendly staff and the decor. Yes, the room is small but if you are out enjoying the delights of Adelaide you are not going to spend much time in your room! Lots of good eateries nearby and eclectic shopping . Only downside is paying for parking. Nice room, small but comfortable. I was expecting a great big piece of art on the wall, we had baby pink walls and a small neon sign. That was the only thing that as disappointing. We did get the late check out and balcony that we requested. The Concierges, the bed and the upstairs balcony/smoking area! The designs of each room are what makes this place. My room was painted pink and had a neon sign of a Japanese anime character mounted on the wall - highly unusual! The rooms themselves are very compact but enough if you're just after a room with the basics - the king-sized bed was a nice touch but I did find the shower a little cramped. There are about a dozen parking spaces available in the garage for $10.50 per day. Room service is available but there are plenty of restaurants and cafès in North Adelaide and the CBD which offer a variety of choices. Staff are only present on-site in the afternoon, usually being based around the corner in the Majestic Old Lion, but I found them to be friendly and helpful. I was offered early check-in for free and given a complimentary room upgrade. If you're after a no-fuss place to rest your head that's just a little different give this one a go. Great, thanks. The art on the walls was unique and excellent for a change. The room was small, but I didn't need much as a business traveller so it was perfect. Check in and access was modest and simple, less staff meant that I felt more independent in managing my own movements. Felt homely. I just love majestic minima hotel!! 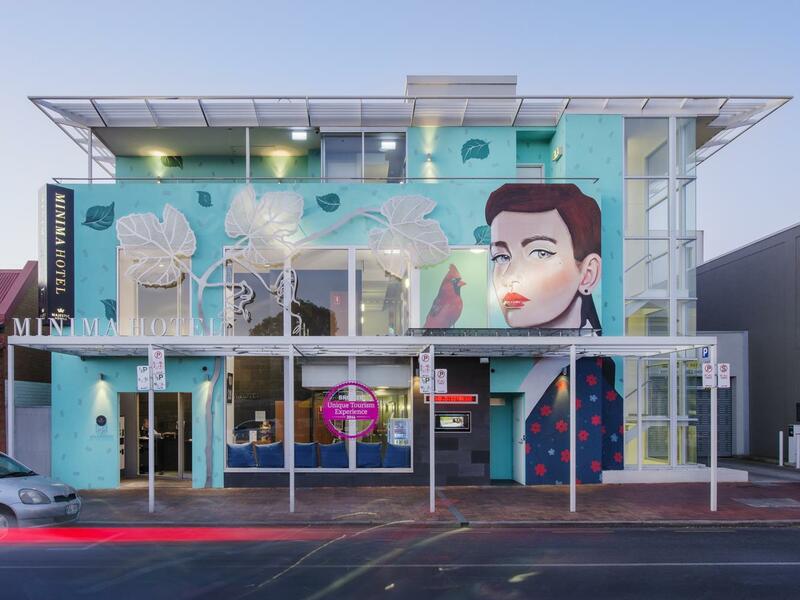 it is located outside city centre of Adelaide but is accessible by free city bus (twice per hour between 6am to 7pm)... the hotel is located in a relaxed community and is of a walkable distance to o'Connell street (north Adelaide) where there is quite a lot of restaurants. travellers perusing tranquility yet with city access should consider this lovely hotel. We've stayed in Majestic for 4 nights, they have given us Room 101 which is really funny with so many faces on the wall. Location is supreme with so many good restaurant nearby. Highly recommend the Primo restaurant. U can either take the bus or walk to the city center. Only one complain is the Air conditioner, the noise is quite loud... except that I have no other complain. Highly recommend and will definitely come again!!! Stayed here with a mate for the weekend - we came over for the footy. Clean and quiet. The facilities are very good and room was well serviced. Excellent access to the city and Adelaide Oval. Close to coffee shops and the Lion Hotel (great meals, including breakfast). The Majestic offices are just around the corner. We were able to leave our luggage there after we checked out and had to kill time before going to the airport. Will definitely recommend and stay again when visiting Adelaide. Space is really small but it was charming nonetheless! Great location, good rates, and its cleanliness are the 3 things we love about this hotel. We will book it again when visiting Adelaide.